Day 7, the 15th, was a day of relaxation with the beauties, women and men alike in their skimpy bathers on the Copacabana Beach. The day would not have been complete without a swim in this famous beach in Rio de Janeiro. To our luck and amazement late that afternoon we witnessed the colourful Gay Mardi Gras. On Day 8, the 16th, we flew to Lima, the Colonial ‘City of Kings’. Lima is the capital and the largest city in Peru. It is located in the valleys of the Chillon, Rimac and Lurin rivers and was founded by Spanish conquistador Francisco Pizarro. We spent some time touring Lima on Day 9, the 17th, visiting a number of well-known sites including the Cathedral, the residential Palace, the Plaza de Armas, and the Catacombs located beneath the San Francisco Convent. This was where we appreciated Lima’s magnificent colonial architecture as well as vignettes of its pre-Colombian past. Day 10, the 18th, was an experience we will never forget. The effects of high altitude were felt by all of us on arrival at Juliaca airport, an altitude of over 4,000 metres above sea level. Dizziness, nausea and headaches were the order of the day and which did not leave us till we reached Machu Picchu, three days later. This did not stop us from taking in the world famous pre-Inca burial ground of Sillustani en route to our beautiful hotel in Puno overlooking Lake Titicaca. Sillustani is considered to be one of the most important necropolises in the world. We wandered through the remarkable tombs built from volcanic stone, known as Chulpas which reached heights of up to 12 metres and overlooking the beautiful lake Umayo. The scenic beauty of Puno in this southern part of Peru is astonishing. The main attraction is the Titicaca, the world’s highest navigable lake, to which the legend attributes the origin of the Inca civilization. Travelling by semi-speed vessel on Day 11, the 19th, we stopped at Taquile Island, a place where time appeared to have stood still. A round 350 Quechua-speaking families live here, operating a collective agricultural system dating from the 14th Century and renowned for their textiles – beautifully woven chumpis (belts), chullos (caps) and ojotas (sandals). The view of the snow capped mountains of Bolivia too from this island was breath taking. We enjoyed a sumptuous South American style hangi here with one of the local families, where the food was cooked underground buried in hot rocks. We then went on to visiting the floating island of Uros, where again the friendly locals continue to practice their traditional way of life, living by fishing. 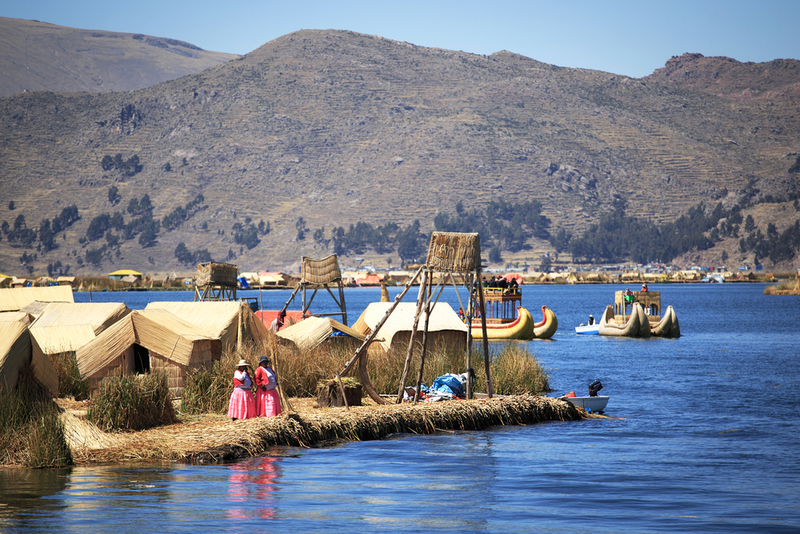 Situated about four kilometres from Puno, the original inhabitants of these floating islands are said to descend from one of the most ancient peoples of the Americas. After breakfast on Day 12, the 20th, we were driven across the Altiplano to Cusco. The ten hour bus ride took us through sleepy Andean villages, past spectacular mountains, sheer cliffs and rampaging rivers. Stops along the way included the atmospheric towns of Pucara and Andahuaylillas, and the pre-Inca ruin of Raqchi. Included on this trip was a sumptuous smorgasbord lunch at a Spanish style hacienda surrounded by garden with a multitude of colour. Click here to read the next part of Chris’s journey. Or let Chimu Adventures organise you an unforgettable trip to South America!